When you visit your dentist in Fresno, have you noticed some changes to your preventive care? Now, new dental innovations are transforming how quickly your dentist can detect potential oral health complications to provide early intervention. From finding cavities to spotting hair line cracks, new developments allow them to find areas of concern sooner to prevent the issue from worsening. At your next cleaning and checkup, you will benefit from a higher level of care using the latest advancements in technology. Now, you will commonly find digital x-rays part of your preventive appointments. When compared to traditional x-rays, digital ones are safer because they use less radiation. In addition, they are often more comfortable because you do not have to bite on films; however, there are additional benefits as well. Digital x-rays provide highly detailed images of your teeth, which can be enlarged. This gives your dentist deeper insight into your oral health to detect even the smallest of concerns, like cavities. They are a quick, easy, and painless way to monitor your oral health. Your dentist can view your entire mouth using an intraoral camera. It is a small video camera that takes x-rays of the outside of your teeth and gums. 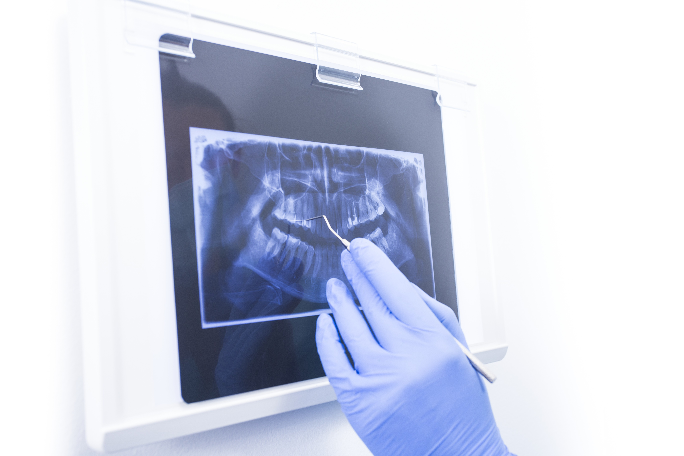 Your dentist can view the images on a monitor to see every aspect of your mouth to pinpoint areas of concern that may not be detected on traditional x-rays, like cracked teeth or tooth decay. Tooth decay remains the most chronic condition affecting Americans. Although it is preventable, it is estimated that 26% of adults have an untreated cavity. This can eventually lead to the loss of your tooth if it is not treated quickly. To find cavities while they are still small, your dentist will use a new detection system. The system will find weak spots in your enamel before they have a chance to form into a cavity. It can also find small cracks and lesions that can be hard to see with the naked eye. By detecting them sooner, they can be quickly treated to prevent them from worsening. A CT/cone beam scanner provides your dentist with the deepest insight into your oral health. It does not just show the health of your teeth and gums, but your bones, blood vessels, and nerves. Your dentist can see the information on one large picture to find certain oral health issues, like an impacted tooth, while also creating personalized treatment plans, such as the placement of dental implants. New advancements in dentistry transform your entire dental experience. In addition to preventive care, restorative procedures are also enhanced by these innovations, like the use of digital impressions, painless injections, or soft tissue lasers. If you are ready to benefit from a higher standard for care, choose a Fresno dentist who embraces a modern approach to dentistry. Since 1991, Dr. Byron Reintjes has helped the community achieve healthy, beautiful smiles. Supported by his extensive training and qualifications, he also uses the latest technological advancements to provide superior care to his patients. If you are looking for a modern dental practice to get the high-quality care you deserve, contact our office today.